The civil action has been instituted and EnviroServ is yet to plead to UHA NPC’s claim. Preliminary skirmishes raised by EnviroServ have delayed this action. On 26 April 2017 UHA NPC obtained an urgent interdict against EnviroServ interdicting them from accepting, treating and disposing of any new waste at Shongweni. The order also stops EnviroServ from disposing of the leachate generated by the waste already on site, back into the waste pile at the Shongweni. 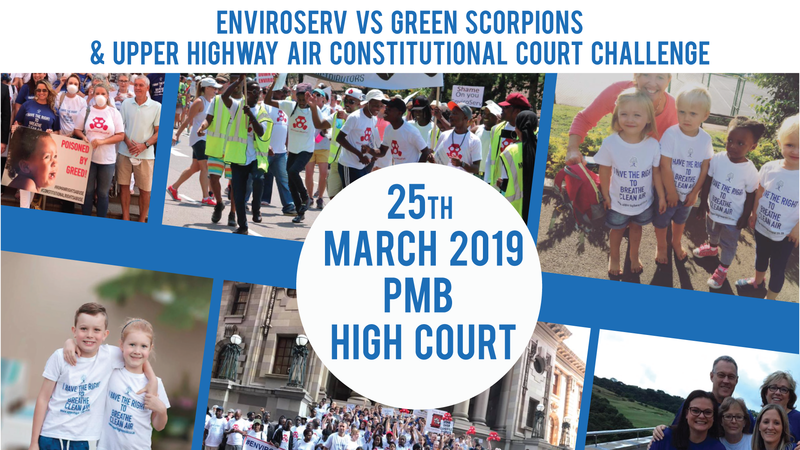 EnviroServ was given permission by the Honourable Judge Kruger to deliver a supplementary affidavit dealing with the mystery polluter EnviroServ claimed was also responsible for the odour impacts. EnviroServ has asked UHA NPC to agree that EnviroServ can delay filing any further papers including who the mystery polluter is, until EnviroServ’s appeal against the Minister’s suspension of its license has been determined. UHA NPC has not agreed to this. The interdict remains in place until the papers above have been filed, UHA NPC have responded on oath and the matter been finally argued again. No date has been set for this. On 12 June 2017 EnviroServ substituted its whole appeal against the Minister’s decision. On 12 July 2017 UHA NPC filed its opposing submissions. On 2 August 2017 EnviroServ filed responding submissions. EnviroServ claims that its revised stance is that it is accepting the suspension of trading at the Shongweni landfill site until its “contributions” to the odour impacts have been addressed and the success or otherwise thereof have been verified. EnviroServ still want to be able to dispose of excess leachate, brine and contaminated storm water back into the waste body instead of transporting it to Holfontein or any other disposal facility. UHA has filed a short reply to this. The Minister will then determine whether to convene an appeal panel or just determine the appeal on the papers filed to date. This matter is back in the Durban Magistrates’ court on 17 August 2017. On the last occasion, the prosecutor indicated the state could be adding accused and additional charges. We now know that additional charges and additional accused have been added. It has been reported that Clive Kidd is one of the additional accused. We expect we will be informed of the remainder when the matter is next in Court on 17 August 2017 or if the NPA make a statement prior thereto. On 17 August 2017 we expect further dates to be set for the hearing of the trial or if the additional accused or EnviroServ want an opportunity to request particulars to the charge sheet / new charges the matter will be adjourned for that purpose. We will only know on the date what will happen as this matter is run by the State. UHA NPC are watching this matter with interest and are heartened by any steps the State takes to ensure that any contraventions of the law are addressed by all involved. EnviroServ is still implementing remedial actions as approved by the DEA from time to time. The DEA approved the trial flare on condition that the DEA can modify or rescind the approval at any time and subject to the DEA being given access to the online monitoring by EnviroServ to assess the results of the trial flare. A final flare design will depend on the results of the trial flare. Flaring is the most practical and feasible remedial action and so the impacts will logically still occur until such time as the flare has been successfully implemented, if possible given they are retrofitting it as opposed to having implemented it before tipping started in valley 2 as recommended in their own Environmental Impact Control Report. The progressive capping of the site has also been approved and construction is underway. Given the levels of pollution WSP have requested and been mandated to do further testing. The H2S levels according to admissions by EnviroServ on 7 June 2017 are at levels which they admit will cause nausea and headaches (at least). The community believes the health effects are as reported by the community. The long-term health impacts of this level of exposure (even at that admitted by EnviroServ) is not certain and clarity is being sought in this regard. EnviroServ also admit long periods of odour impacts (i.e. nuisance).